Weather: Clear sky, windy at higher elevation of mountain, Temp- mid 60’s. It’s been quite some time since I last posted anything on this site, but I finally got in gear and produced this colorful scene. I must admit that this was by far the best view and conjunction of PanSTARRS and the Crescent Moon. I had scouted some scenic spots around the neighborhood but none gave me the Southwest look I had in mind. Harquahala Mounatins here I come! A mild to tracherous climb on my “4×4″ and 5 miles later at 2500ft elevation, I found what I was looking for. 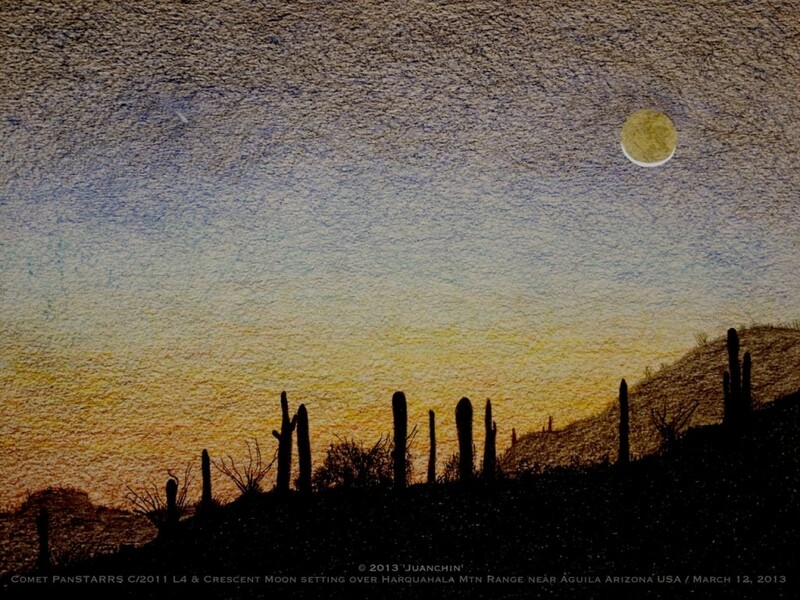 There in the distance of a sloping mountain stood a set of Saguaro cacti and Ocotillo trees, silhouetted against the backround twilight sky. The sketch was not made on site, it would take me forever and the setting conjunction only had another 20 to 25 minutes before it was gone. A rough sketch was in order, jotting down pertinent objects and annotating further details like; varying colors of the twilight sky, degree of earthshine on the Moon and so on. Well, in choosing my paper grade, I got a Canson 12″ x 18” / 30 x 45 cm. with a slight texture finish on the surface. I was loving the results as I first lay down the sky colors but, later on, I was noticing that there were tiny uncolored pockets left uniformly. I continued anyhow, but it would give a hard time later when I added the comet. Some of those pockets were as big as the comet itself and would render it almost invisible. Well, I worked around it until I was satisfied. I might have given PanSTARRS one full magnitude more than necessary but, I’ll do it for the sake of showing it. Out in the field, remember, you had to squint your eyes or avertedly look for it, if you knew its whereabouts. Convenience over quality. I cheated by not connecting my scanner to the computer and instead took a picture of the sketch. Once on my phone, I messed with the exposure and contrast to liven up the colors somewhat. I also used it to put some text at the bottom of the sketch along with my name. Well, you be the judge! Juanchin, I’m lovin the juxtaposition contrast of serene sky scene complete with cometary interloper and rugged desert landscape. I think inadvertently the textured paper has given the comet that hint of ‘trickiness’ that requires a touch of averted vision to get the best view. I agree with you and the contrasting subjects but it was quite the job to render it. At times, I had to apply a darker layer on all color tones. As for Arizona being the place for astronomers, you couldn’t be any further from the truth. One of Arizona’s natural resource is, its clear dark skies! The Southwestern US with its desert climate, provides stunning clear skies almost year round. Yes, Frank McCabe’s sketch is phenomenal, though we didn’t bump shoulders while he was here. You picked a great spot to make this sketch. The graininess adds much to the scene. You have captured the desert landscape and twilight sky perfectly. Beautiful sketch and art. Great Juanchin ! I like your drawing ! PanStarrs gives to all of us a so nice spectacle ! @ Frank- I’m happy to know I’m getting some positive comments on a job I didn’t think was worth of merit. This site at the Harquahala mountains is an excellent place. I do most of my observing sessions out there . @Aquarellia-Everyone should’ve gotten a glimpse of the comet by now ( maybe Chippingdale too), I can’t wait to see what comet ISON will bring to us this fall. And I sure bet it was a great experience! I once attended a star party there with a known radio and tv personality, Dr Sky. (Drsky.com) Very scenic place to do some nightime observations. Too bad the weather hasn’t cooperated in your favor. Maybe while you wait for better skies, you can enjoy this short clip I put together .